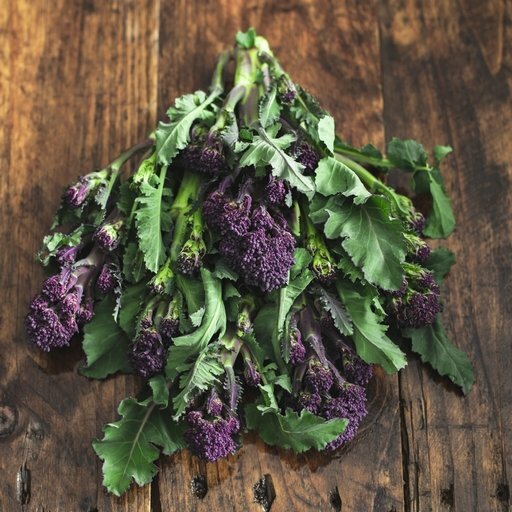 To our delight, purple sprouting broccoli has enjoyed a renaissance over the last few years. Vigorous, wild and woolly-looking, it’s a delicacy that’s equal to asparagus. Not only that, it appears early in the year, when other homegrown greens are in short supply. One of our favourite vegetables – a real seasonal star. PSB (as it’s affectionately known around here) is like asparagus – the less you do to it the better. Boil, steam or stir-fry for a quick, fresh finish, or roast or griddle to intensify the flavour. Serve simply with olive oil and lemon, drizzled with creamy hollandaise, or dipped spear by tender spear into a soft-boiled egg. Delivered from our farm, so wash before cooking. Keep cool in a larder or fridge. Appears in boxes from February to May. Grown at our farms it's an ideal winter veg for the UK climate.